Visibility: is shown by default. Hide / Show condition could be set using AND / OR parameters. Use Text element to display a text on the app screen. The element can contain static text as well as dynamic, which is loaded from the other elements of the Platform or API calls using hashtag. Text: the string entered to this field would be displayed to the AppUser. Label - the text the AppUser would see on the screen for this particular option. Value: Is used in case you want to store the value different from the Label of the option in the Backend. For example: the Option Label might say "I like it", and in the Value you might store "LIKE". Use it to visually separate parts of the same screen. Use single divider to make a slight separation and double or more dividers to make group of elements to look like a plank. Functions within a screen. Can render data from any hashtags. Can override style settings. Can display html code stored in Object’s column when that column is hashtaged in HTML filed of this Element. Can be used to create a fully custom experience on top of basic Mobsted infrastructure. Use Row element to place several elements in a row. 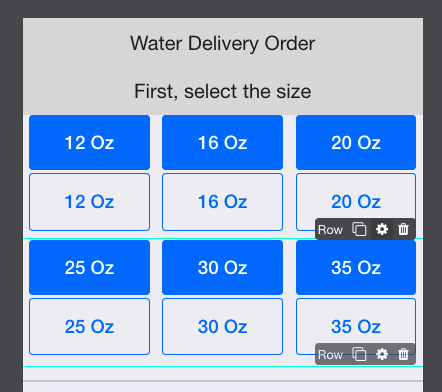 Using rows in water delivery App to select the size. We had two sets of rows with the pairs of buttons in each column. We made them visible / hidden using Variables.